What are common types of allergic conditions, and what are allergy symptoms and signs? What specialists treat people with allergies? How do health care professionals diagnose allergies? What are treatment options and medications for allergies? 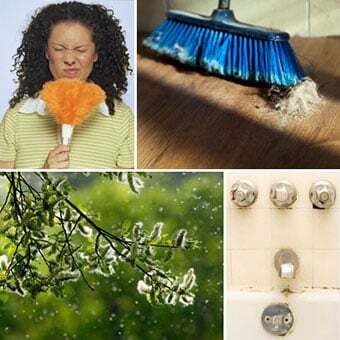 Are there home remedies for allergies? What is the prognosis of allergies? The immune system is a complex system that normally defends the body against foreign invaders, such as bacteria and viruses, while also surveying for abnormal changes in an individual’s own cells, such as cancer. 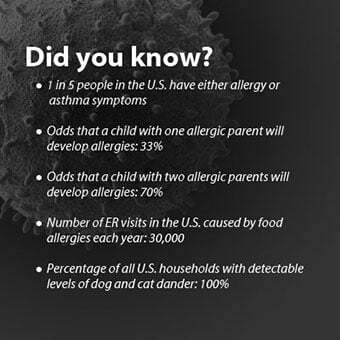 While the environment plays a role in the development of allergy, there is a greater risk of developing allergic conditions if a person has a family history of allergy, especially in parents or siblings. This is a review regarding how the allergic response of the immune system occurs and why certain people become allergic. 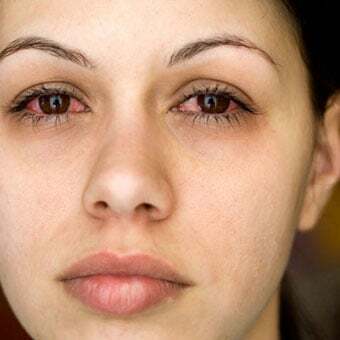 The most common allergic diseases are described, including allergic rhinitis (nasal allergies), allergic conjunctivitis (eye allergies), allergic asthma, urticaria (hives), and food allergies. Allergy-producing substances are called "allergens." Examples of allergens include pollens, dust mites, molds, animal proteins, foods, and medications. When an allergic individual comes in contact with an allergen, the immune system mounts a response through the IgE antibody. People who are prone to allergies are said to be allergic or "atopic." Approximately 10%-30% of individuals in the industrialized world are affected by allergic conditions, and this number is increasing. Allergic rhinitis (nasal allergies) affects roughly 20% of Americans. Between prescription costs, physician visits, and missed days of work/school, the economic burden of allergic disease exceeds $3 billion annually. A common scenario can help explain how allergies develop. A few months after the new cat arrives in the house, dad begins to have itchy eyes and episodes of sneezing. One of the three children develops coughing and wheezing. The mom and the other two children experience no reaction whatsoever despite the presence of the cat. How can this occur? 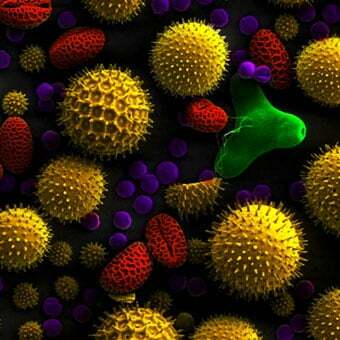 The immune system is the body's organized defense mechanism against foreign invaders, particularly infections. Its job is to recognize and react to these foreign substances, which are called antigens. Antigens often lead to an immune response through the production of antibodies, which are protective proteins that are specifically targeted against particular antigens. These antibodies, or immunoglobulins (IgG, IgM, and IgA), are protective and help destroy a foreign particle by attaching to its surface, thereby making it easier for other immune cells to destroy it. The allergic person however, develops a specific type of antibody called immunoglobulin E, or IgE, in response to certain normally harmless foreign substances, such as cat dander. Other antigens, such as bacteria, do not lead to production of IgE, and therefore do not cause allergic reactions. Once IgE is formed, it can recognize the antigen, such as cat dander, and can then trigger an allergic response. IgE was discovered and named in 1967 by Kimishige and Teriko Ishizaka. In the pet cat example, the dad and the youngest daughter developed IgE antibodies in large amounts that were targeted against the cat allergen. The dad and daughter are now sensitized or prone to develop allergic reactions on repeated exposures to cat allergen. Typically, there is a period of "sensitization" ranging from days to years prior to an allergic response. Although it might occasionally appear that an allergic reaction has occurred on the first exposure to the allergen, there needs to be prior exposure in order for the immune system to react. 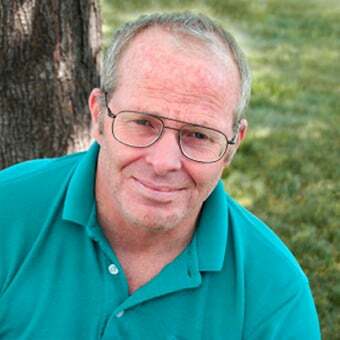 It is important to realize that it is impossible to be allergic to something that an individual has truly never been exposed to before, though the first exposure may be subtle or unknown. The first exposure can even occur in a baby in the womb, through breast milk, or through the skin. IgE is an antibody that all of us have in small amounts. Allergic individuals, however, generally produce IgE in larger quantities. Historically, this antibody was important in protecting us from parasites. In the example above, during a sensitization period, cat dander IgE is overproduced and coats other cells involved in the allergic response, such as mast cells and basophils, which contain various mediators, such as histamine. 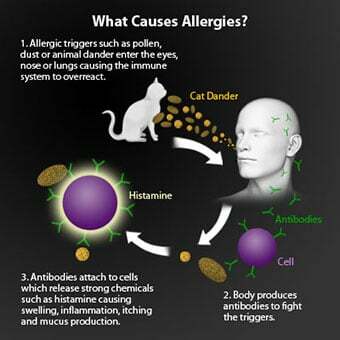 These cells are capable of leading to an allergic reaction on subsequent exposures to the cat allergen (cat dander). The cat protein is recognized by the IgE, leading to activation of the cells, which leads to the release of the allergic mediators mentioned above. These chemicals cause typical allergic symptoms, such as localized swelling, inflammation, itching, and mucus production. Once primed, or sensitized, the immune system is capable of mounting this exaggerated response with subsequent exposures to the allergen. On exposure to cat dander, whereas the dad and daughter produce IgE, the mom and the other two children produce other classes of antibodies, which do not cause allergic reactions. In these nonallergic members of the family, the cat protein is eliminated uneventfully by the immune system and the cat has no effect on them. Another part of the immune system, the T-cell, may be involved in allergic responses in the skin, as occurs from the oils of plants, such as poison ivy, poison oak, poison sumac, reactions to metal, such as nickel, or certain chemicals. The T-cell may recognize a certain allergen in a substance contacting the skin and cause an inflammatory response. This inflammatory response can cause itching, rash, and discomfort. Allergies can develop at any age, but most food allergies begin at a young age, and many are outgrown. Environmental allergies can develop at any time. The initial exposure or sensitization period may even begin before birth. Individuals can also outgrow allergies over time. It is not fully understood why one person develops allergies and another does not, but there are several risk factors for allergic conditions. Family history, or genetics, plays a large role, with a higher risk for allergies if parents or siblings have allergies. There are numerous other risk factors for developing allergic conditions. Children born via Cesarean section have a higher risk of allergy as compared to children who are delivered vaginally. Exposure to tobacco smoke and air pollution increases the risk of allergy. Boys are more likely to be allergic than girls. Allergies are more common in westernized countries, and less common in those with a farming lifestyle. 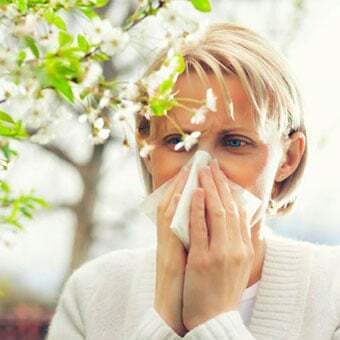 Exposures to antigens, use of antibiotics, and numerous other factors, some of which are not yet known, also contribute to the development of allergies. This complicated process continues to be an area of medical research. The parts of the body that are prone to allergic symptoms include the eyes, nose, lungs, skin, and gastrointestinal tract. Although the various allergic diseases may appear different, they all result from an exaggerated immune response to foreign substances in sensitive individuals. The following are brief descriptions of common allergic disorders. In 1819, an English physician, John Bostock, first described hay fever by detailing his own seasonal nasal symptoms, which he called "summer catarrh." The condition was called hay fever because it was thought to be caused by "new hay." swelling (particularly of the lips, face, hands, and feet). 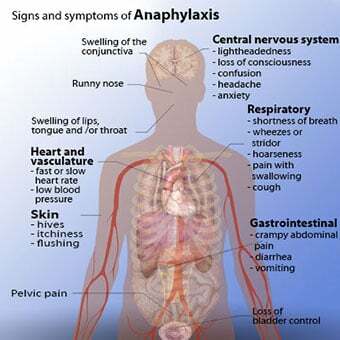 Anaphylactic shock is an emergent, life-threatening condition that occurs when blood vessels dilate excessively due to an allergic reaction, which causes a significant drop in blood pressure. This can result in inadequate blood flow to the organs in the body. 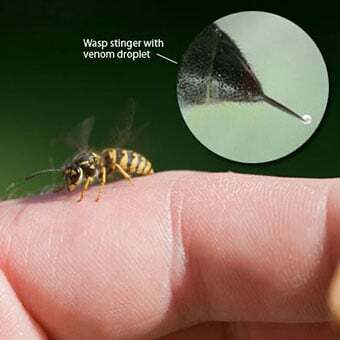 Allergens may be inhaled, ingested (eaten or swallowed), applied to the skin, or injected into the body either as a medication or inadvertently by an insect sting. The symptoms and conditions that result depend largely on the route of entry and the type of allergen. The chemical structure of allergens affects the route of exposure. Airborne pollens, for example, tend to have little effect on the skin. They are easily inhaled and will thus cause more nasal and respiratory symptoms with limited skin symptoms. 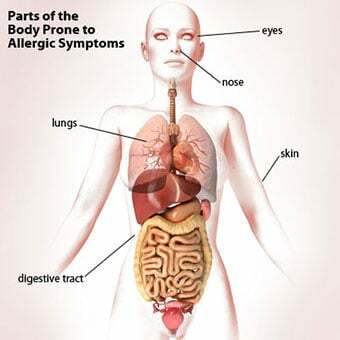 When allergens are swallowed or injected, they may travel to other parts of the body and provoke symptoms that are remote from their point of entry. For example, allergens in foods may prompt the release of mediators in the skin and cause hives. The specific protein structure is what determines the allergen's characteristics. Cat protein, Fel d 1, from the Felis domesticus (the domesticated cat), is the predominant cat allergen. Each allergen has a unique protein structure leading to its allergic characteristics. Aside from oxygen, the air contains a wide variety of particles, including allergens. The usual diseases that result from airborne allergens are hay fever, asthma, and conjunctivitis. The following allergens can trigger allergic reactions when inhaled by sensitized individuals. Foods: The most common food allergens are cow's milk, eggs, peanuts, tree nuts, wheat, soy, shellfish, finned fish, and sesame. Cow's milk, egg, wheat, and soy allergies are most common in children and are often outgrown over time. The most common allergens in adults are peanut, tree nuts, and shellfish. It should be noted that gluten is not a common food allergy, and true gluten hypersensitivity, or celiac disease, is mediated by another type of antibody (not IgE but IgA) and also leads to a different host of symptoms (including chronic abdominal discomfort, nausea, vomiting, change in stool, anemia). Medications: Although any medication can cause an allergic reaction, common examples include antibiotics (such as penicillin), and anti-inflammatory agents, such as aspirin and ibuprofen. Notably, many individuals who think they are allergic to medications actually can tolerate the medication without difficulty. Source: iStock, Color Atlas of Pediatric Dermatology Samuel Weinberg, Neil S. Prose, Leonard Kristal Copyright 2008, 1998, 1990, 1975, by the McGraw-Hill Companies, Inc. All rights reserved. Although primary-care physicians are well equipped to treat mild allergic symptoms, allergy/immunology physicians (allergists) treat individuals with more bothersome allergies. Many allergists treat both children and adults, but some are specialized to either patient group alone. For environmental allergies such as pets, dust mites, pollen, and molds, skin prick testing is the best test to help with diagnosis of allergy. Blood work looking for the allergic antibody (IgE) is less sensitive and may miss some allergies. For food allergy testing, the most important part of the diagnosis is the health history. Skin testing or blood work (specific IgE testing) should only be ordered if the history is suggestive of food allergy. Without a suggestive history, food allergy skin testing and blood work is not very specific and has a high rate of false positive results. For food allergy testing, ordering skin testing or blood work (specific IgE testing) for broad panels of foods is discouraged, given the high rate of false positive results. For drug allergy, the history is the most important element in diagnosis. 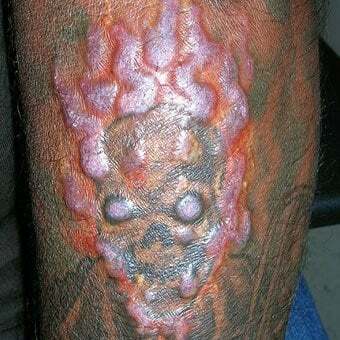 The only antibiotic with validated skin testing is penicillin. Penicillin skin testing can be very helpful in determining if an individual is truly allergic to penicillin and related antibiotics. Blood work (specific IgE testing) is not particularly helpful for the diagnosis of drug allergies. 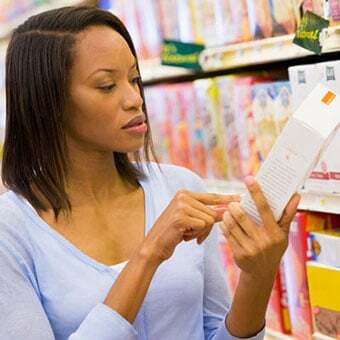 Sometimes, such as with food allergy and drug allergy, despite a detailed history and appropriate testing, the diagnosis of allergy remains unclear. In these situations, it is appropriate to consider a “graded challenge,” which is the “gold standard,” or the best test, for the diagnosis of allergies. A graded challenge should always be performed with an allergist in a setting equipped to manage a severe allergic reaction, such as anaphylaxis. Environmental control measures: These have limited efficacy. For dust mites, it helps to decrease humidity in the home and wash bedding in hot water once weekly. For pets, avoidance is most effective. Cat allergen is airborne, so having a cat in the home will cause allergic symptoms. Keeping dogs out of the bedroom may help reduce symptoms. Bathing both cats and dogs may decrease the allergen burden somewhat. There is no such thing as a hypoallergenic dog, but hypoallergenic cats have been bred. 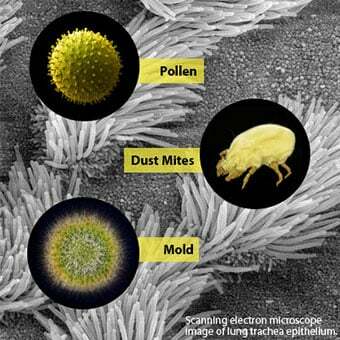 For pollen, keeping windows closed and staying indoors on high pollen days may be helpful. Epinephrine is the one and only treatment for anaphylaxis, which is a severe allergic reaction that can involve multiple body systems and is life-threatening. Epinephrine is administered with an auto-injector into the muscle in the lateral thigh. Up to 20%-30% of severe allergic reactions may require treatment with more than one dose of epinephrine, so individuals who carry epinephrine should ideally carry two auto-injectors. If an individual experiences anaphylaxis and uses epinephrine, they should call 911 to be appropriately monitored. Of note, antihistamines such as diphenhydramine (Benadryl) are not appropriate treatments of anaphylaxis. Allergy shots have been shown to decrease symptoms of environmental allergies and asthma and may also be beneficial in eczema. 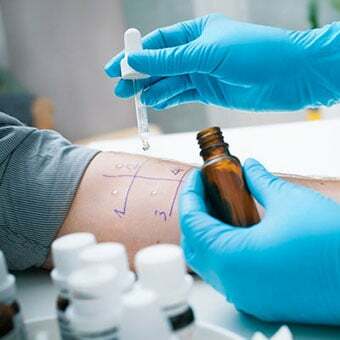 Allergy shots should be prescribed by an allergist and should always be administered in a health care facility equipped to manage a serious allergic reaction (anaphylaxis). Allergy shots help make the body less sensitive to the culprit allergen, such as pets, dust mites, pollens, and molds. Recently, the FDA has also approved immunotherapy that can be administered with a tablet under the tongue (sublingual immunotherapy). To date, this is only available for grass and ragweed. Unlike allergy shots, sublingual immunotherapy can be administered at home because the risk of a severe allergic reaction is lower with sublingual therapy. Of note, although there is significant research being done in the area, immunotherapy is not routinely used to treat food allergies. The treatment of food allergy remains avoidance of the culprit food and management of accidental exposures with the appropriate medications. Although there is significant research examining the role of vitamins, herbal medications, and other therapies on the treatment of allergies, there are currently no proven home remedies that successfully treat allergies. People with allergies have an excellent prognosis. Many children outgrow allergies over time, particularly food and medication allergies, such as penicillin. On the other hand, allergies can develop at any age. Allergies should not affect life expectancy, and with proper management, the majority of individuals with allergies should maintain an acceptable quality of life. With the increasing prevalence of allergic conditions, many studies have examined risk factors for allergies and how to modify these to potentially prevent allergies. 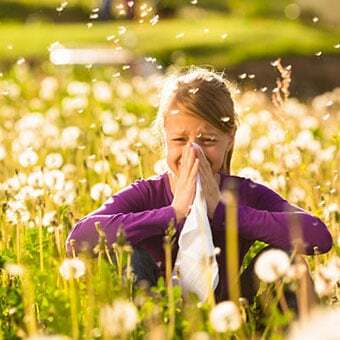 The development of allergies results from a complex interplay between a person’s genetic make-up (genotype) and its interaction with the environment (phenotype). Having family members with allergic conditions increases the risk of allergy. Numerous environmental influences may also affect the development of allergy, such as breastfeeding, cesarean sections, diet during pregnancy, vitamin D levels, use of antibiotics, use of probiotics, animal exposures, pollutant exposure, and diet during infancy. Of all the factors studied to date, it appears that introducing highly allergic foods into the child’s diet before one year of age may decrease the risk of food allergy, particularly peanut allergy. Allergen immunotherapy (allergy shots) have also been shown to decrease the risk of developing future environmental allergies and asthma. Finding additional ways to prevent allergic conditions remains an active area of research. Fiocchi A, Assa'ad A, Bahna S; Adverse Reactions to Foods Committee; American College of Allergy, Asthma and Immunology. "Food allergy and the introduction of solid foods to infants: a consensus document. Adverse Reactions to Foods Committee, American College of Allergy, Asthma and Immunology." Ann Allergy Asthma Immunol 97.1 July 2006:10-20; quiz 21, 77. Price D, Bond C, Bouchard J, Costa R, Keenan J, Levy ML, Orru M, Ryan D, Walker S, Watson M. "International Primary Care Respiratory Group (IPCRG) Guidelines: management of allergic rhinitis." Prim Care Respir J 15.1 Feb. 2006: 58-70. Epub 2005 Dec 27. American College of Allergy, Asthma & Immunology. "Food allergy: a practice parameter." Ann Allergy Asthma Immunol 96(3 Suppl 2) Mar. 2006: S1-68. No abstract available. Flinterman AE, Pasmans SG, Hoekstra MO, Meijer Y, van Hoffen E, Knol EF, Hefle SL, Bruijnzeel-Koomen CA, Knulst AC. Determination of no-observed-adverse-effect levels and eliciting doses in a representative group of peanut-sensitized children. J Allergy Clin Immunol 117.2 Feb. 2006: 448-54. Scibilia J, Pastorello EA, Zisa G, Ottolenghi A, Bindslev-Jensen C, Pravettoni V, Scovena E, Robino A, Ortolani C. "Wheat allergy: a double-blind, placebo-controlled study in adults." J Allergy Clin Immunol 117.2 Feb. 2006: 433-9.